What made you decide to take over the running of the villa? Taryn Burns who was running The Lebombo Villa B&B in Big Bend was moving, and we saw this as a great opportunity to get involved and make it work involving our family. It is ideally situated in Big Bend en-route to Mozambique. It is easily assessable for us to manage on a daily basis from our house, where we live. We do not reside at the B&B. It has always been one of our dreams to run a B&B. Initially we had a few guests stay with us, at our house using our outside cottage as a B&B for a few months. The Villa is much more up market and is a fantastic place to have a B&B. With a total number of 10 rooms at the Villa, converting it to a B&B has been a breeze. We have been in Swaziland our whole lives and really enjoy the steady flow of traveling tourist’s and the businessman who stays over at the Villa. We take pleasure in helping them with advice and directions around Swaziland. Accommodation in Swaziland spread around so finding Accommodation at The Lebombo Villa, in Big Bend Swaziland is a Gem. Who do you see your major clients as being? What is your target audience? There are a number of clients we are hoping to attract. Firstly we are hoping to attract clients that are enroute to Mozambique or who are on their way back from Mozambique. We have a remote controlled gate and a wall that surrounds the property therefore, really secure and safe parking for all their boats and trailers. It is the perfect stop enroute to Mozambique because it is 1 hour from the Mozambique Border and 1 hour from the South African Border. Accommodation at The Lebombo Villa B&B, in Big Bend, Swaziland provides clean and immaculate rooms that are fully air-conditioned and have en-suite bathrooms. It is a comfortable change from the hot beaches and sandy floors that we all enjoy as part of our holidays in Mozambique. We also welcome the ‘self-guide’ traveler thru Big Bend. The Villa is well sign boarded from the Main Road in Big Bend and walk-in bookings are always welcome. We are also hoping to attract the Businessman. He can enjoy a drink, from our Honesty Bar and relax next to our swimming pool or unwind with a game of snooker after a long day. A variety of restaurants and Country Club in close proximity to the Lebombo Villa B&B offer good suppers at affordable prices for an evening out. Menus are available at Villa. We are also very welcome to visitors in the area that are purely here to relax and visit with friends. Monthly boarding or guests who are looking for some where to stay for a long period of time are able to negotiate better prices and packages. Breakfast in the mornings consists of the traditional English breakfast plus fruits and cereals offered with coffee or tea. How do you see tourism progressing in Swaziland? We are all working hard to make sure that Tourism in Swaziland is always on the increase. Swaziland Tourism Board keeps Swaziland on the Map. We have a wealth with so many talents, crafts and places to see that are so unique to Swaziland. We have Ngwenya Glass Factory that uses recycled materials, The Swazi Candle Factory, all the Swazi Craft Markets in Ezulwini. In Malkerns there is a hub of amazing talents; you have the Gone Rural Ladies who weave the most amazing things and you have Baobab Batik just to name a few. Tourist Bus’s and Self Drive Tourist’s make the most of all the Game Reserves and Parks that are in abundance here in Swaziland. Big Bend had 2 Game Reserves that are all self drive, and the famous Mkhaya Game Reserve only 30 km away We have so much to offer here that Tourism can only progress and we will be getting stronger and better at the accommodation and facilities that are on offer to all our travelers, even the local ones. Is providing accommodation in Swaziland a viable business or do you need to bundle it? Ideally, you would be at your optimum business peak when you are able to fill every room in your accommodation establishment, every night of the week. However we have only been at the Villa for a month or so, and we have had a steady flow of guest’s throughout the month. Not fully booked yet but we are presently surprised at the number of guests we are getting. With our marketing strategies now at full force, we hope to increase our number of guests. 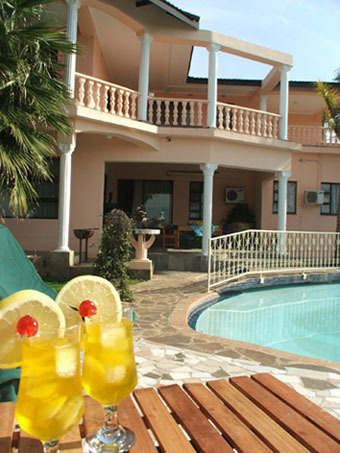 We are on the Internet at http://www.swazilive.com/thelebombovilla.htm and you can email us directly at The Lebombo Villa. Our Monthly adverts can be seen in the ‘What’s Happening in Swaziland’, which is freely available as well as in the bi-monthly local paper ‘Big Bend Talker”. We also have our flyers out in every information point and will be in the high gloss ‘What’s on in Swaziland’ in May. We have really enjoyed taking over at The Lebombo Villa B&B, and providing accommodation that is clean and up market is really satisfying. Guests appreciate and enjoy the welcoming feel they get at the Villa and we hope that they enjoy their stay, as much as we enjoy providing luxury accommodation for them. Running The Villa is a full time occupation, as housekeeping and control need to be managed daily. So at the moment I can safely say that we have no need to buddle our business. We are hoping for more conferences and block bookings to keep the guests coming. I don’t think we would change anything. We offer 10 very comfortable en-suite bedrooms, which is fully air-conditioned and serviced daily. There is big swimming pool at The Lebombo Villa that is cool and clean. We also have a large Plasma TV with DSTV on offer. There are a variety of rooms with Super King beds, King Size Bed, Double Beds and ¾ Beds. This spacious B&B is situated in the small town of Big Bend, which is nestled in the Lowveld Region of Swaziland, overlooking the spectacular Lubombo Mountain’s. It is ideally situated 1-hour enroute to Mozambique and SA Borders. Accommodation in Swaziland at The Lebombo Villa B&B is the perfect half way stop between KZN and Mozambique. Home cooked meals and friendly service make staying here all the more special. A snooker table is also available to the relaxing guest. We also have Safe and Secure parking for all Boats and Trailers. A 9-hole Golf course, Tiger Fishing and Game Viewing are all offered within close proximity. At the Villa you are ensured of a great stay, as you will you experience real Swazi Hospitality. I would not change a thing!